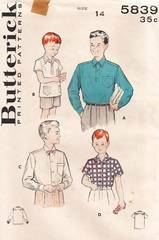 Vintage 50's Butterick sewing pattern 5839. Polo shirt with long or short sleeves. Regulation long or short sleeve shirt. Boys Size 14; Chest 32; Neck 13.5. Pattern is uncut and complete. Average age toning; good condition.